1. Coffee Solution : mix instan coffee, sugar and boiled water in a bowl. Mix to dissolve. Set aside. 2. 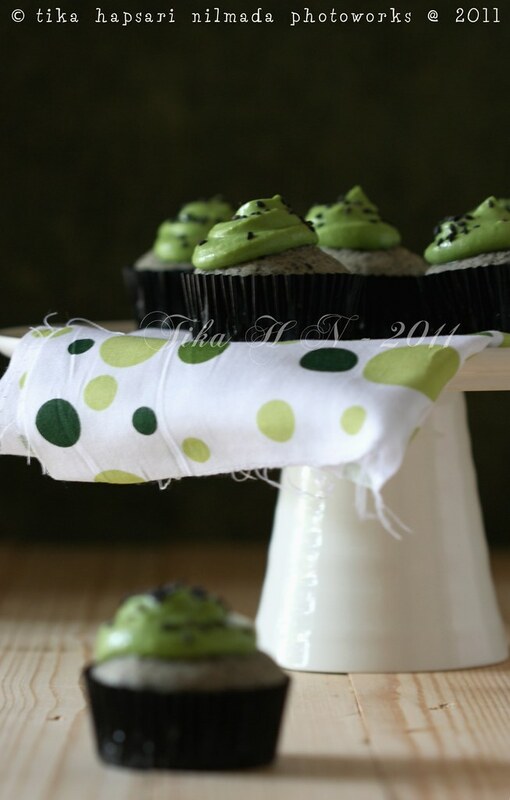 Green tea mascarpone : beat mascarpone cheese, tiramisu paste and matcha until smooth and creamy. Add sweet condensed milk and heavy cream. Mix to blend well. Set aside. 3. Dip the sponge fingers into the coffee liquid. Let them soak on each side enough to become damp but not soggy. 4. Line the bottom of the glass with a layer of sponge fingers. Spread the green tea mascarpone mixture on top of the sponge fingers layer. 5. Refrigerate for at least a couple of hours or preferably overnight to let it set well. 2. Green tea mascarpone : kocok keju mascarpone, pasta tiramisu dan green tea bubuk sampai rata. Masukkan susu kental manis dan krim kental. Kocok rata. Sisihkan. 3. Celupkan sponge finger ke dalam larutan kopi. 4. Tata di dasar gelas kecil. 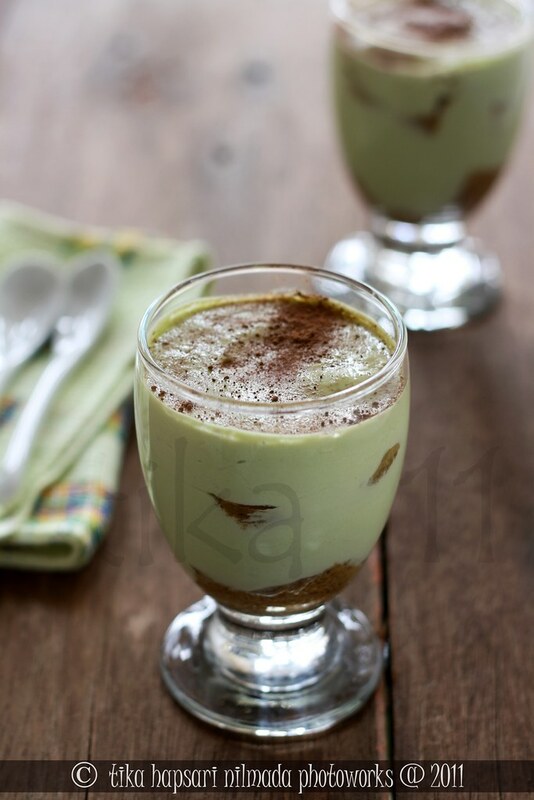 Sendokkan campuran green tea mascarpone. 6. Sajikan dingin setelah ditaburi coklat bubuk. I had so much fun making poffertjes. 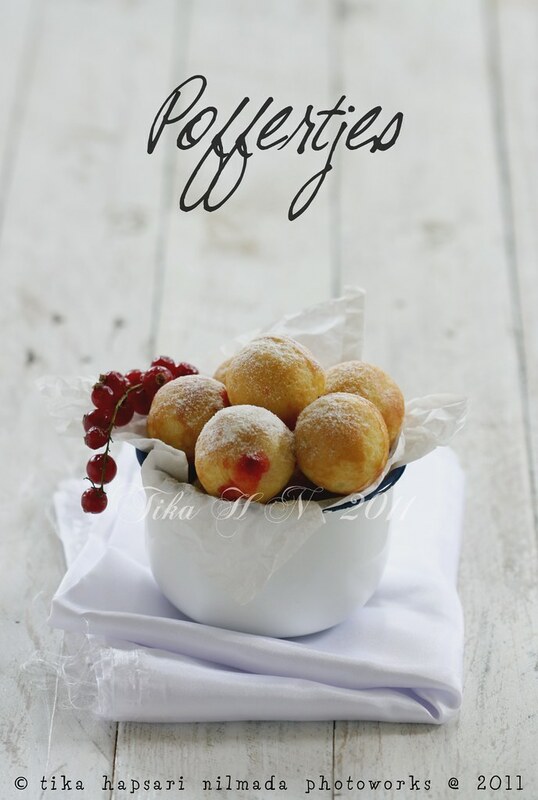 I enjoyed the process of shaping the poffertjes into balls (it's the best part) ! :D At first, I overwhelmed with how to do it right. Some poffertjes from my first attempt were almost sphere-shaped. But they had mouth wide open on one side :D Just like someone laughing and you can see the inside. 1. 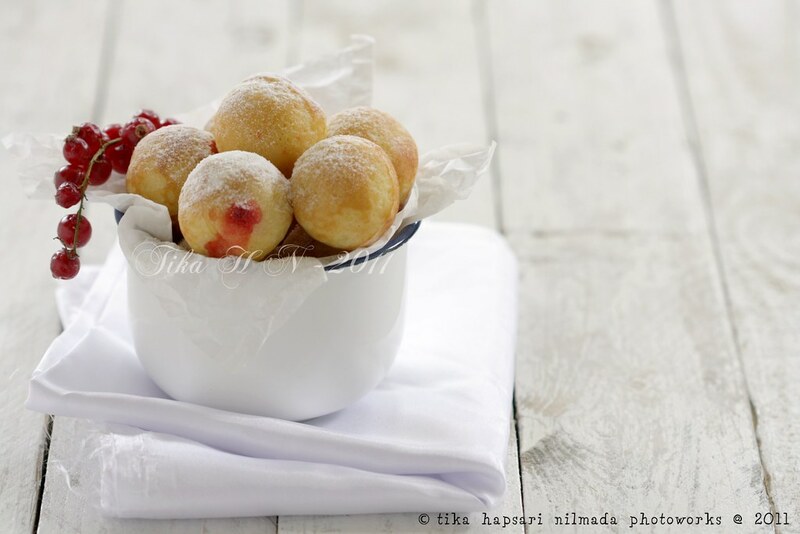 Mix flour, sugar and instant yeast in a bowl. Set aside. 2. Heat the milk until lukewarm. Remove from the heat, set aside. Beat eggs. Pour milk, mix well. 3. Make a hole in the flour, pour the egg mixture. Stir it all together. Make sure there are no lumps int the batter. 4. Add melted butter and salt. Stir to give the batter the desired consistency. 5. Let the dough sit for 30 minute. 6. Preheat the poffertjes pan and lightly grease with butter. 7. Fill them only halfway or less with the batter. 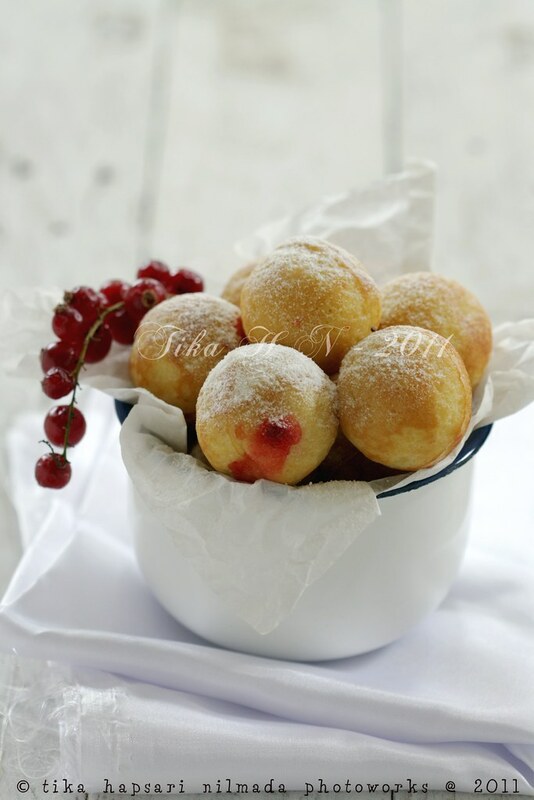 Filled with strawberry jam. Pour more batter over the pan. Let the poffertjes cook for while until the bottom has started to harden. Use bamboo stick or bamboo skewer to turn them around. Pierce the poffertjes with the skewer and use a circular scooping motion to roughly flip the half-ball over, so that the uncooked batter flows out into the mold to form a ball. Don't forget to turn them around for several time until cooked and until golden brown color. 8. Transfer onto a serving plate, dust with powdered sugar on top.Serve hot ! 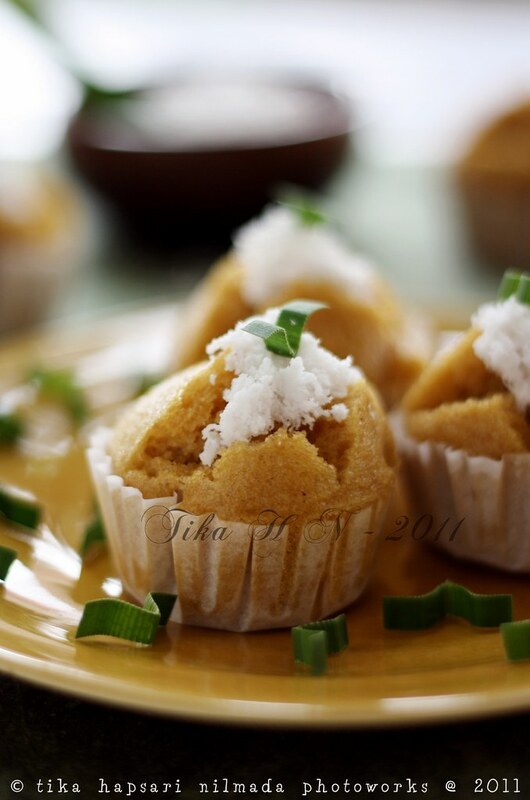 Note : The recipe in Bahasa Indonesia is here. I used exactly the same ingredients, except for the filling. I changed the cheddar cheese with strawberry jam. This recipe from Xiaolu - 6 Bittersweets has stolen my attention from the very beginning I came across to the post. Black sesame on the cake is new to me. If you have time to sneak out and take a look at Xiaolu's photos of these cupcakes (which are really far away better and prettier than mine), you must be agree with me ! I don't know what was wrong with my frosting. Mine was too runny, while Xiaolu's was firmer and steady. I have to admit, these cakes are delish, rich in texture from the grounded black sesame seeds and the sweet smell from vanilla extract. Even the unbaked batter already spread the good smell throughout the kitchen. And for the result....I'm in love with the shape, smell and the taste of it ! I made it for my hubby's birthday. Though we didn't celebrate his birthday with a party, but we like to spend the time only for the three of us (me, hubby and son). 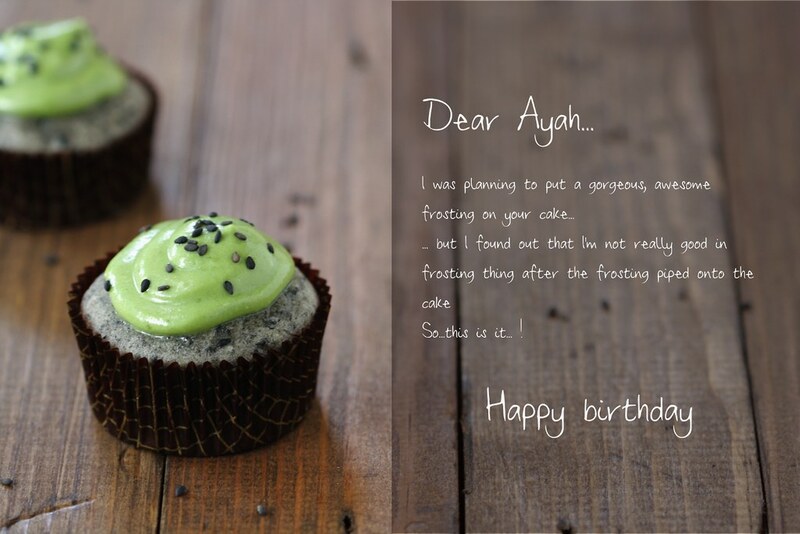 All my best wishes goes to you, Ayah. Hope Allah give you health and strength. Amiin. 1. Preheat the oven to 375 degrees F. Line a standard muffin pan with 12 baking liners. 2. Toast the sesame seeds in a dry pan on the stove over medium heat, stirring them constantly, until they are fragrant (about 2 minutes). Crush toasted seeds with a mortar and pestle OR spice grinder until they are the texture of damp sand and set aside. Separately, sift the dry ingredients into a medium bowl; set aside. 3. Cream the butter and sugar in a large bowl until light and fluffy. Add the ground sesame seeds, egg, and vanilla and beat until combined. Gradually beat in half the dry ingredients. Add the milk and mix well. Lastly, add the remaining dry ingredients and mix until batter is well-combined and smooth. 4. Fill cupcake liners until they are about 2/3 full. Lift the pan 1-inch above the kitchen counter and carefully slam it down to expel any large air bubbles in the batter. Bake for 14 to 18 minutes, or until a skewer inserted in the center comes out clean. Remove cupcakes from pan as soon as safely possible. Cool completely before frosting as desired. 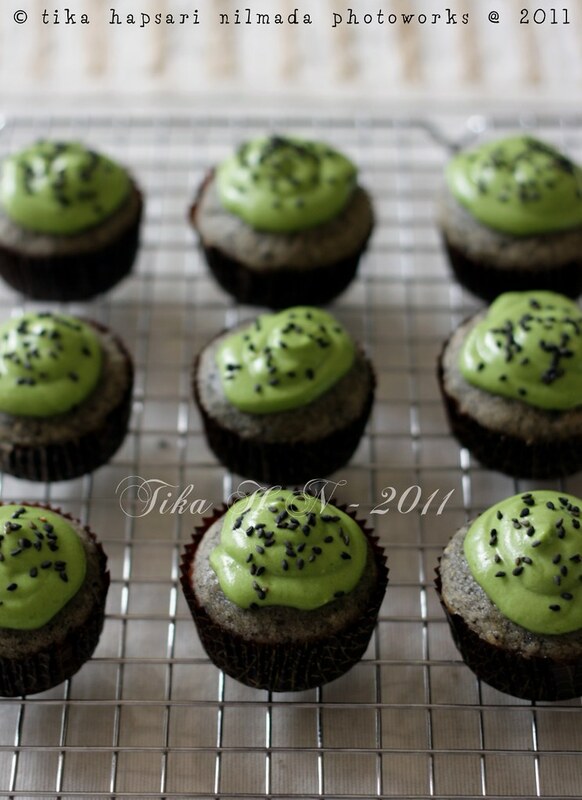 Sprinkle the top of each cupcake with extra sesame seeds. Sift powdered sugar and matcha together into a small bowl. In a larger mixing bowl, cream the butter, powdered sugar mixture, and vanilla until thoroughly blended. Add the cream cheese, a chunk at a time, beating after each addition (just enough to work it in). 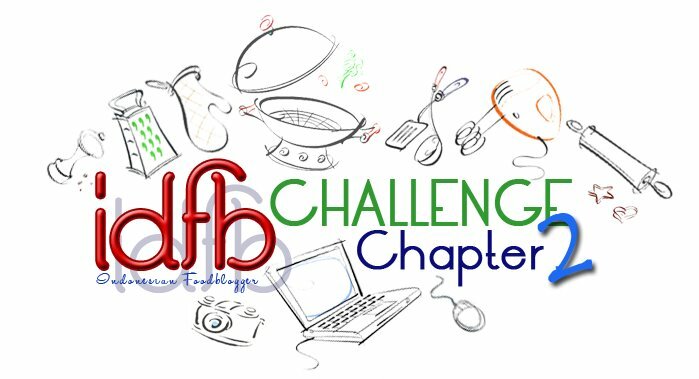 Indonesian Foodblogger group on FB is running a new challenge. 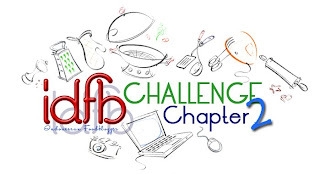 IDFB Challenge Chapter 2, with Indonesian Snack as the theme. 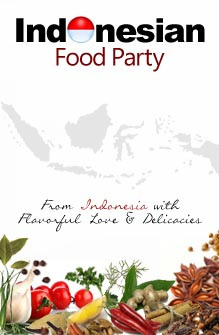 I feel very happy that this group challenges its members to cook Indonesian food. Means that I can try and explore Indonesian foods in my kitchen. Yet the monthly feast on Indonesia Food Party hosted by Tata and Momon growing by numbers, I celebrate the party by sending this post as an entry. Like this one, Apang gula merah is a traditional snack from Manado, North Sulawesi. Usually serve on takir (the pandan leaf cups). Make pandan leaf cups is quite challenging, but I'd rather to play safe :D . So I used paper cups, but don't worry, because I didn't change the recipe. If you want to make apang gula merah, feel free to choose what do you want to use for the cups, pandan leaf cups or paper cups like me. I leave it in your hand. Apang cakes or kue apang usually cracked open on the surface once they are steamed. Coconut sugar gives a specific taste and flavor, mixed with spekoek powder make this cake so special. The wonderful smell of this cake come from spekoek powder. Sweet and fragrant. If you know nothing about spekoek powder, I will explain a little about it. Spekoek powder is a mixture of cinnamon, nutmeg, cardamom and clove. You can make it by mixing the cinnamon powder, nutmeg powder, clove powder and cardamom powder. 1. Boil coconut water, coconut sugar and pandan leaf, keep stirring until coconut sugar dissolved. Remove from heat and strain, measure 200 ml. 2. Pour a little into the rice flour while stirring until smooth. Let it cool. 3. Add flour, yeast, coconut milk, salt, and spekoek powder while stirring for 15 minutes. 4. Let stand for 30 minutes. Add baking powder. Mix well. 5. Pour into muffin pans that have been filled with paper cups. 6. Steam for 15 minutes over high heat until cooked. 7. Topping : Mix grated coconut, salt, and pandan leaves. Steam for 15 minutes until cooked. 8. 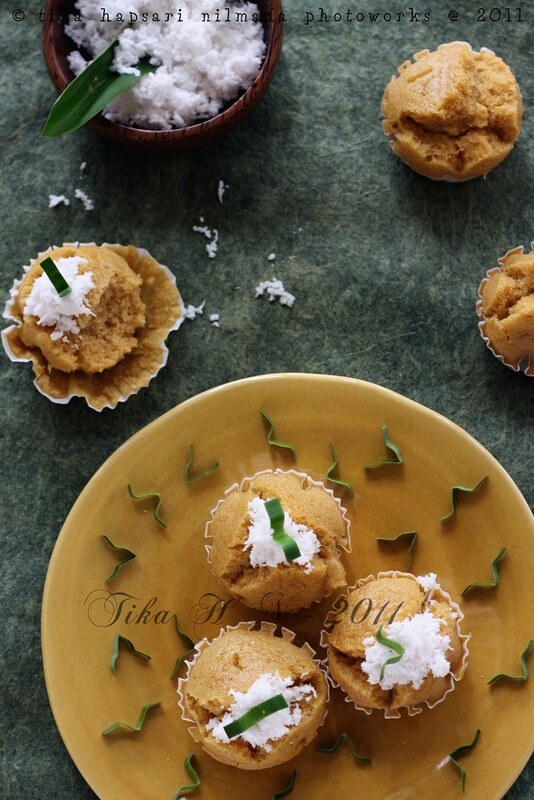 Serve with a sprinkling of grated coconut. 1. Rebus air kelapa, gula merah dan daun pandan sambil diaduk sampai larut. Angkat dan saring. Ukur 200 ml air gula. 2. Tuang sedikit-sedikit ke tepung beras sambil diuleni hingga lembut. 3. Setelah dingin, masukkan tepung terigu, ragi instan, santan, garam dan bumbu spekuk sambil dikocok perlahan 15 menit. 4. Diamkan 30 menit. Tambahkan baking powder. Aduk rata. 5. Tuang dalam cetakan muffin yang sudah dialasi paper cup. 6. Kukus 15 menit di atas api besar sampai matang. Angkat. 7. Taburan : aduk rata kelapa parut, garam dan daun pandan. Kukus 15 menit sampai matang. 8. Sajikan dengan taburan kelapa.